A weapon’s holster is an object that is meant to encase a weapon, keeping it secure but within reach. A gun holster does exactly this. 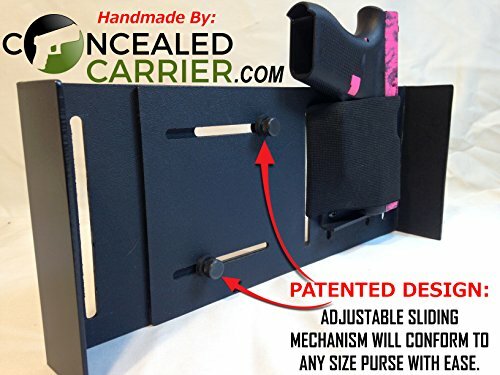 It places your firearm safe and snug, within easy reach in case of danger, but concealed when there is no immediate threat. 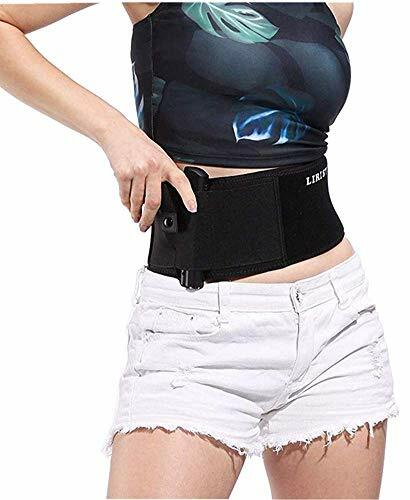 Having a gun holster helps you feel safe because you know you have quick access to protection, and since most gun holsters are placed on somewhere on your body, you know exactly where to reach when you need it. 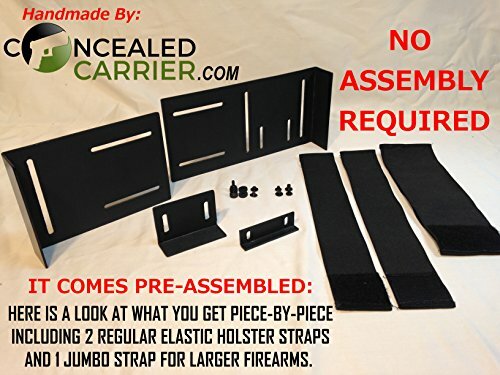 Most holsters are made to offer concealment for your piece. Your firearm can, therefore, be concealed under your clothing no matter the type of outfit you have on. 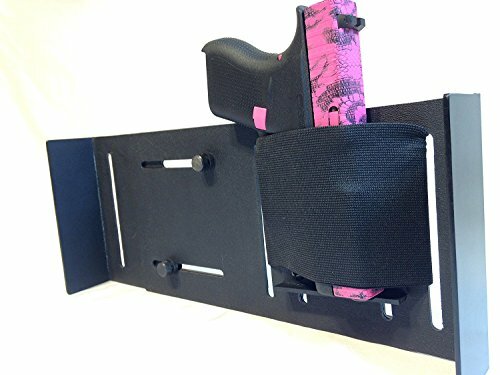 In this article, I will show you the different types of holsters available out there for women, and the different areas of the body you can put them so that you are prepared for anything. We all agree that a gun is a necessity these days given the rising insecurity. As ladies, we are more at risk of being preyed on, and we need proper protection on our person at all times. A gun eliminates the need for you to do the damsel in distress thing when you are attacked, relying on the kindness of a stranger. As the saying goes, better have it and not need it, than need it and not have it. So now you have your means of protection, but where to put it? 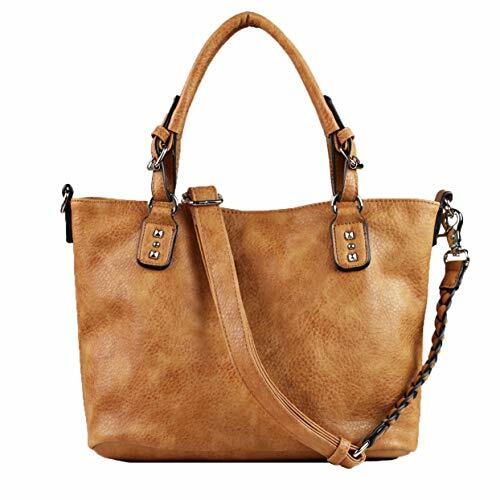 You could carry your piece around in a handbag or purse- a surprisingly large number of women do this- in which case you might be reluctant to spend a few dollars to get a holster which will do the same job as your purse. Holsters ensure the gun is secure. A good holster keeps the gun in one place, and if you switch on the safety before holstering your gun, your gun will stay this way until you turn it off. In a bag, or purse, or even a pocket, a movement may turn off the safety, something that could have disastrous consequences. Holsters protect the gun’s trigger guard so that there is no accidental firing. Can you imagine how sad it would be if the contents of your purse came spilling out and your gun went off once it hits the ground? Or if an innocent child put his hand in your bag and the gun went off? A good holster protects the gun’s exterior from wear and tear. A holster protects the guns from the elements as most of them being waterproof, sweatproof, and durable. Holsters negate the need to carry a whole bag on your person every time you go out. 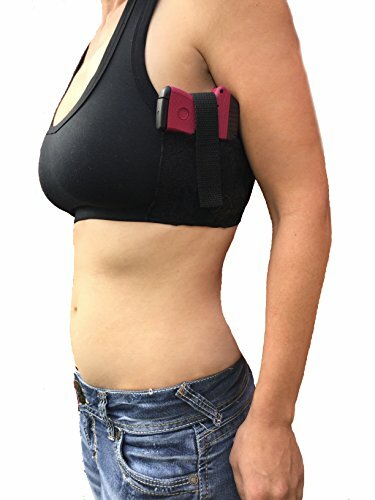 Like I mentioned earlier, most holsters attach to a part of your body and can be concealed whether you are wearing a skirt in the office, or wearing a bodycon dress during a night out. Most thieves go for your bag or purse first. If your bag is grabbed and that is where all your protection lays, what will you do to protect yourself? Holsters keep your firearm on your body and thus promote quick self-defense. Now that we all agree that gun holsters are important for moving our pieces around in, let us get down to the specifics. I have listed 9 of the best gun holsters available for women out there. I have used user reviews to gauge how good they are. 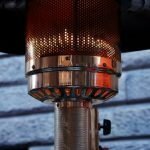 All you have to do is go through the list, pick one that fits your needs, and go to amazon.com to get one. This is not just a regular sports bra, although a passing glance would make you think that it is. If you know what you are looking for though, you will notice that the left side has a lace covered pouch, and that is the holster. The bra is a product of Daltech Force, a US-based company that designs and creates products for law enforcement and the military, so you can trust them when they say that the bra’s material is high quality. It is made completely from cotton, with a bit of lace detailing on the left-hand side where the holster is located. The holster is on the left and is meant for a right-hand cross-draw. It will comfortably hold a small gun that is up to 4 inches wide. 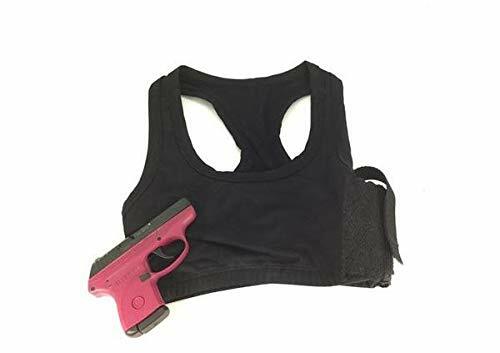 The bra is double padded for comfort, and the holster is made of high-grade Velcro that carefully conceals your firearm, making sure it does not print on the outside of your clothes. It is made like a sports bra, so you can wear it while doing a range of activities, like working out in the gym. The bra comes in a range of sizes to ensure maximum comfort for everyone: size 2 to size 12. It is made from a high-quality material that is long-lasting. The bra is completely made from cotton and has a dual layer that ensures comfort when worn, even when working out in the gym or jogging. 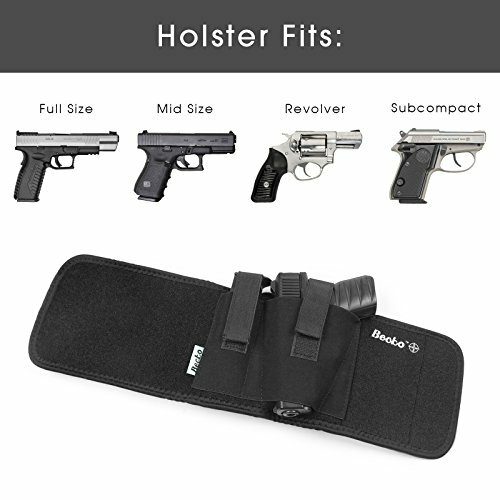 The holster is made from high-quality Velcro and elastic, which means that your firearm will not print on the outside of your clothing. It is made for a right-hand cross-draw and is therefore not suitable for ambidextrous withdrawal. It comes in only black and white so far. ZERO PRINT HOLSTER - Designed with concealed carrying in mind. 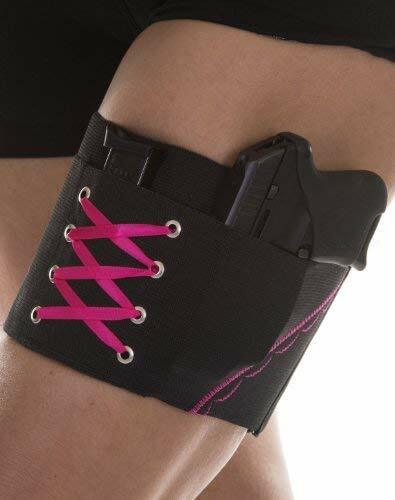 It is a wonderful option for women to concealed carry easily. Tucks underneath the arm for discreet carry of small guns. COMFORTABLE CONCEALED CARRY - Easy underarm concealment so comfortable you forget your even wearing it. See our size chart for information on fit and sizing. 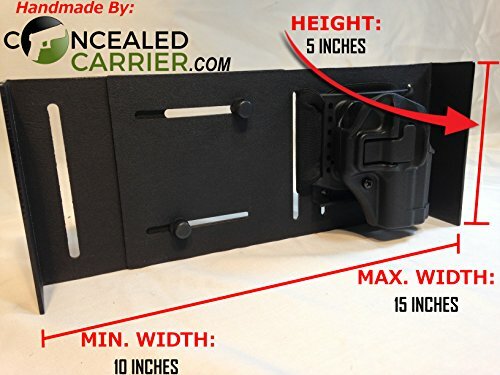 DESIGNED TO FIT SMALL GUNS - Fits guns like the Bodyguard, Ruger LCP and Kel-Tec P3AT, P32, Sig Sauer P238, Colt Mustang, Diamondback DB380, Beretta Bobcat and Tomcat, Kahr 380, Taurus P22/P25, NAA Guardian, Magnum Research Micro Eagle, Walther PPK/S and all similar sized guns. MADE FROM HIGH QUALITY MATERIALS - 100% premium USA made lace and elastic for durability. We use military grade materials because we design and create products for law enforcement & military so we use the same high quality materials on all of our products. Comes in Black and White. SECURE COMFORT - Lightweight, Dual layer sports bra with lace accent over holster for comfort and security. 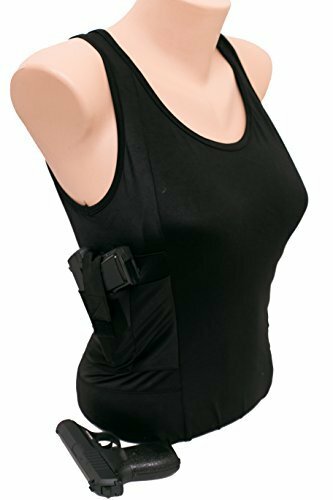 The Graystone Holster Tank Top Shirt Concealed Carry Clothing for Women is law enforcement approved. It is made from a blend of high-quality polyester and spandex for maximum fit and compression. The compression design means the weapon does not print through your clothing. The fabric is lightweight at only 2 ounces and is thus comfortable to wear even when running about. The Graystone Holster Tank Top has holsters under both arms. They are located lower under the arm compared to most brands of underarm holsters. 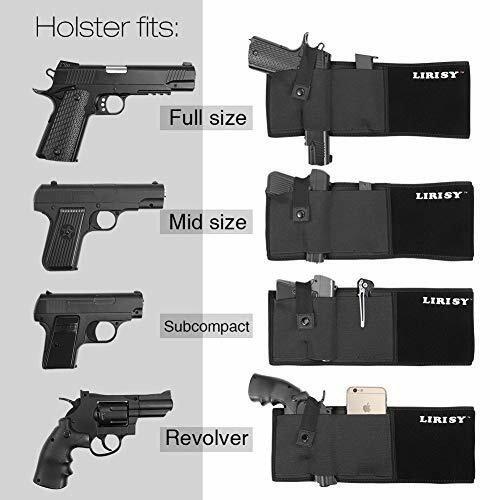 Each of the holsters also has a smaller pocket beside it which can house a smaller firearm, extra magazines, cell phones, or first aid utilities. The compression design of the tank top provides extra body shaping when worn. The high-grade materials the holsters are made from ensure that your firearm does not print against your outer clothing. 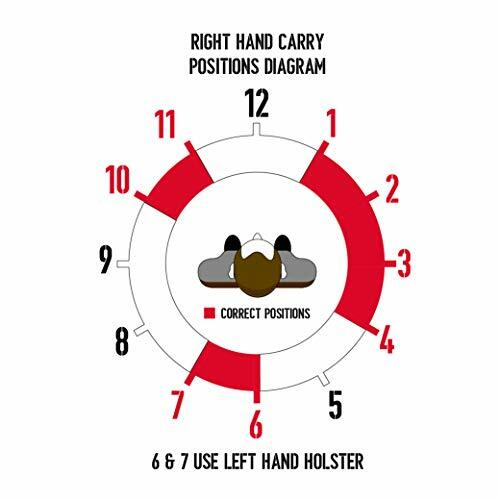 Holsters are located under both arms, and this proves useful for ambidextrous withdrawal. The holsters are located lower under the arms, and this makes it easier to withdraw the firearm in an emergency. The polyester and spandex material may be unattractive to some users. 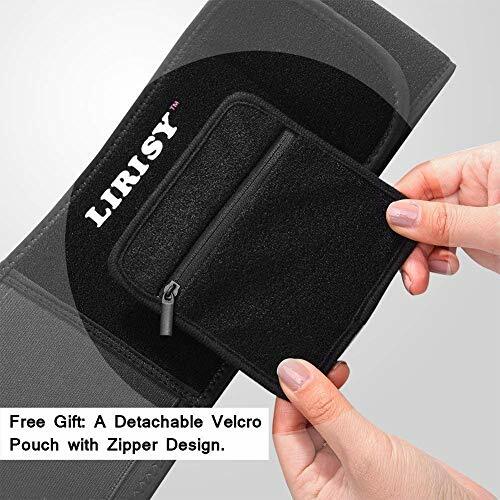 The LIRISY Belly Band Holster for Concealed Carry is made from neoprene, a lightweight, breathable material that will not pinch your waist hair or soak in sweat when you go through your activities. The neoprene is thick enough to handle the weight of a gun without straining you or slipping from its position. 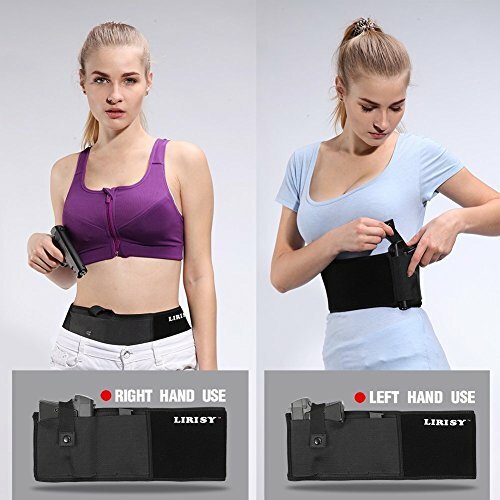 The LIRISY Belly Band Holster for Concealed Carry is discreet and can be properly concealed by a range of clothes, from gym wear to tight party wear. It fits a gun that is 4-8 inches long and can thus comfortably handle a revolver. 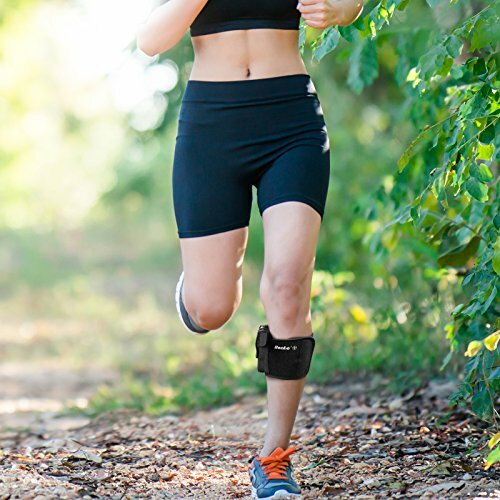 The band is versatile, allowing for adjustments of up to 45 inches of waist size. The band can be rotated to place the holster either on the right side or to the left, depending on the user’s preference. 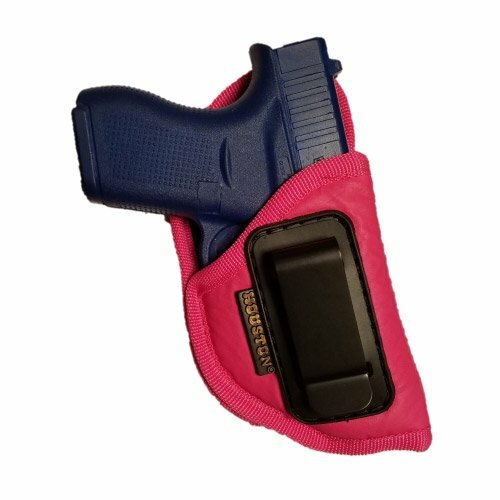 The holster has an extra fixed magazine pouch and a removable pouch that can fit a smaller firearm, a knife, or sensitive documents. 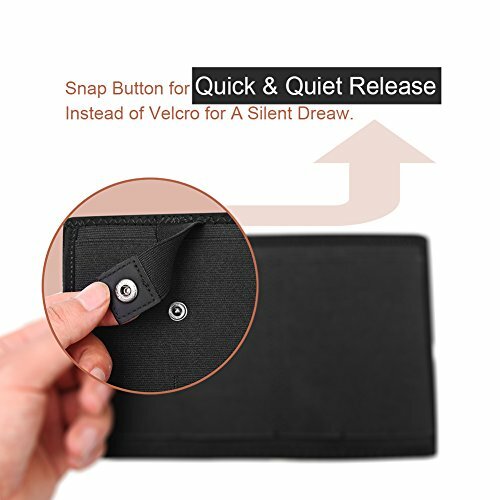 Unlike most designs, the retention snap uses a button to open. 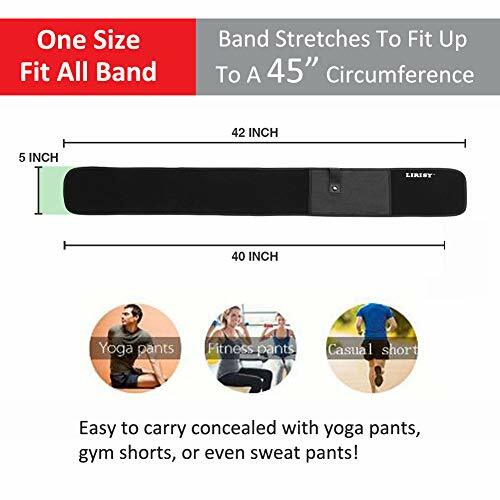 The band is adjustable and can fit a wide range of waists, and there is little need to worry about whether or not the belt will fit. 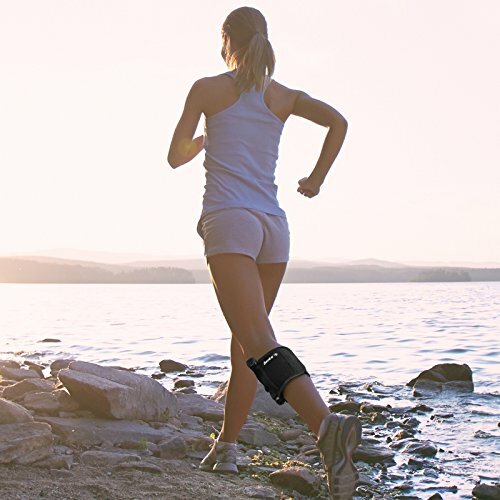 The band can be raised or lowered to stay at a position preferred by the user. The band can be rotated to either side and is thus suitable for ambidextrous drawing. The removable pouch can be used to hold valuables like money, credit cards, and identification documents. The button on the retention snap permits discreet withdrawal for usage. Some users may find it too bulky. AMBIDEXTROUS DESIGN: Our Belly Band Holster is Ambidextrous that Can Be Rotated for Left or Right Hand Draw. 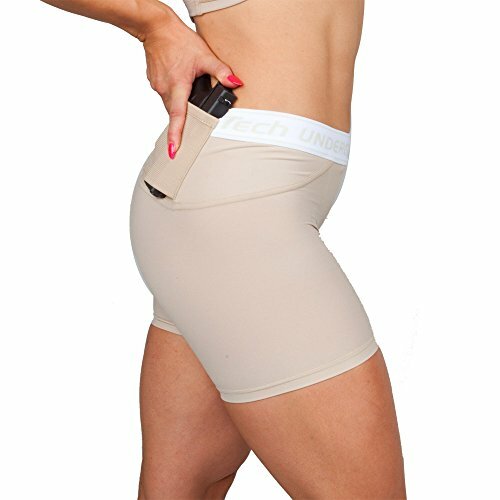 The Women’s Concealment Shorts by UnderTech Cover are compressed shorts that have rave reviews from users. These shorts are popular with female law enforcement agents. They have two holsters at the back, around the waist. This means they can house two guns, or one gun and an extra magazine in the other pocket. They are good for when wearing skirts, dress, or trousers without a waistband. The concealment shorts fit and secure, and reach up to mid-thigh length, meaning they can be easily covered even by a short party dress. They are comfortable, and carter for women of size 0 to size 18. They are compressed shorts that fit snugly and comfortably against the body, offering some shaping. The shorts have two holsters, making them suitable for ambidextrous withdrawal. They cater for a wide range of female sizes. One needs to confirm their size before purchasing. They have warranty restrictions, and cannot be returned if opened. 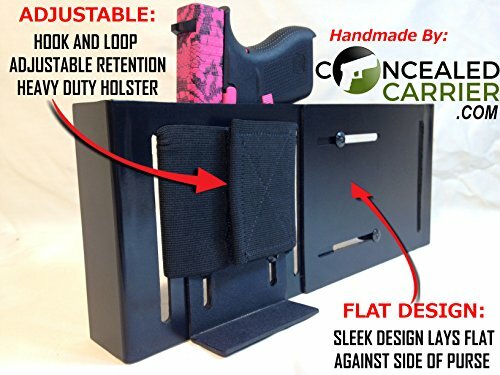 The Can Can Concealment Garter Classic Woman’s Holster is a compression holster meant to house subcompact semi-automatics or revolvers under 6 inches in length. The garter is made of silicone and has two rows of hypoallergenic non-slip grip to ensure a snug fit on the thigh, making it easy to conceal under skirts, pants or dresses. 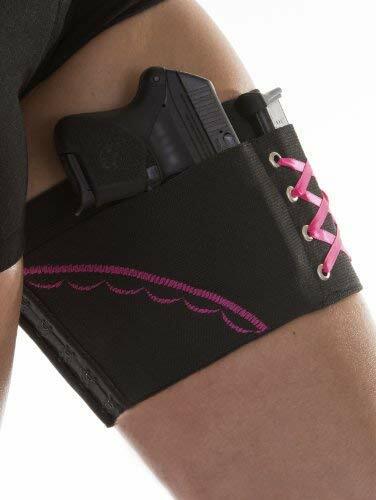 The garter holster has two holster pockets, and can thus fit two guns and 1 magazine. The holster pockets have magnets that provide extra grounding for the gun. It has two rows of hooks and eyes that allow for adjustments for a perfect fit. It can be worn on the inside or the outside of the thigh, and either on the right or the left leg. The garter can be worn either on the right or the left thigh, making it suitable for ambidexterity. It has a row of hooks and eyes that allow for adjustment to fit the user’s size and preference, whether on the upper or the lower thigh. The holster pockets have magnets to provide extra security for the gun. The holster fits only small guns and thus is not suitable for larger guns. One needs to be careful when choosing one of these holsters as one size does not fit all. One needs to be sure of their own measurements first before picking the holster. 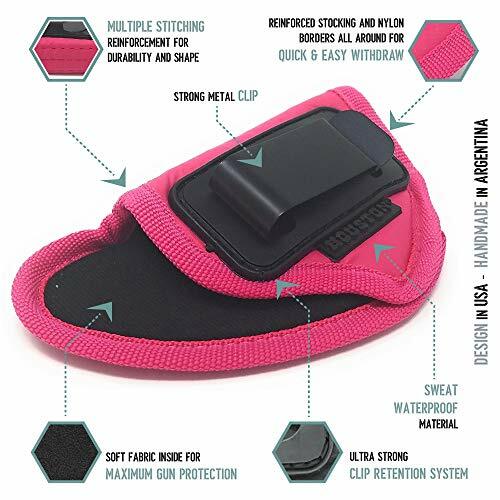 The Becko Ankle Holster for Concealed Carry is made from neoprene and elastic material, making it stretchable to fit ankle sizes of up to 16 inches. The material is breathable and durable, making it comfortable for wearing when performing a range of activities. 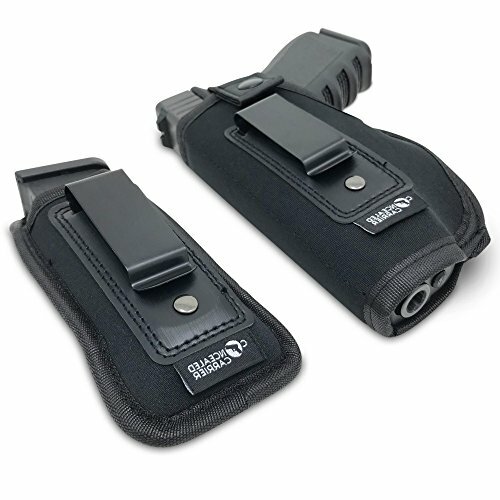 The holster has thick inner pads that ensure that the gun’s weight is properly supported. 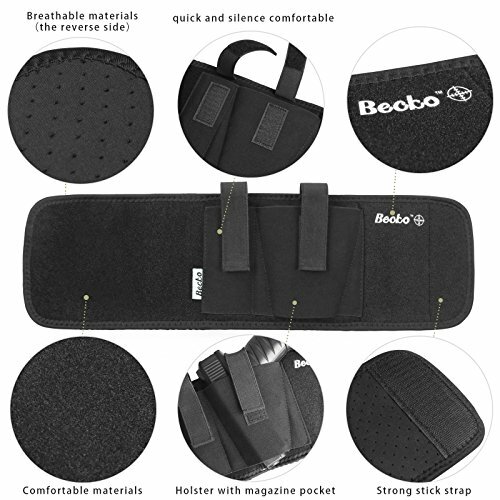 The Becko Ankle Holster for Concealed Carry is suitable for a range of guns of different sizes. It has a snap button at the holster, which makes it convenient when drawing. The holster can be rotated, worn on the inside or on the outside of the ankle, and can be worn on either the right or the left leg. There is an extra slot for holding an extra magazine. Its design supports big, heavier guns comfortably without straining the user. The snap button makes withdrawal easier and discreet. 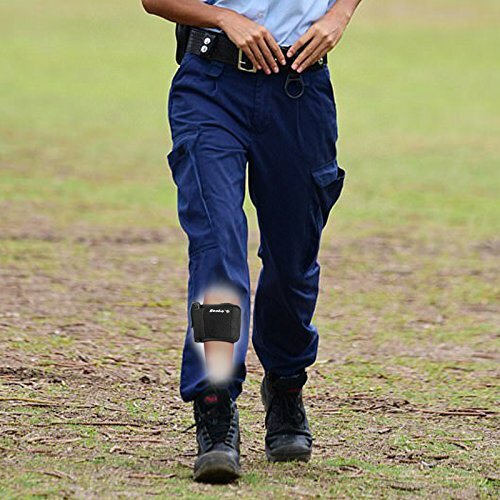 The Becko Ankle Holster for Concealed Carry can be worn inside or outside clothing. It can be rotated and worn on either leg, so it supports ambidexterity. Withdrawing a firearm from the ankle is not easy especially when under pressure. It is easy to put the attacker on alert and on the defensive. It is hard to retrieve a gun from the ankle when running. EXCELLENT FLEXIBILITY & CONVENIENT CLOSURES - Constructed by highly stretchable material, Becko's holster can perfectly fit your body. 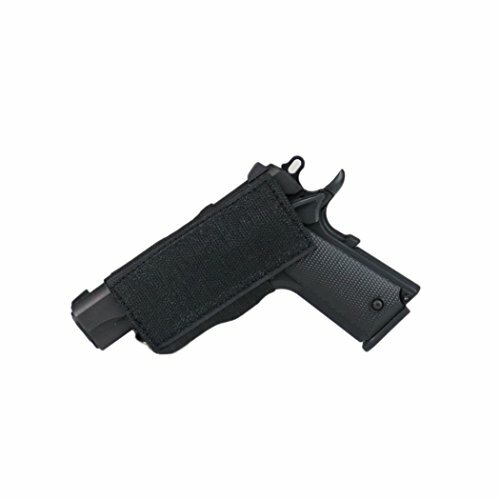 Velcro closures are convenient (Snap button is convenient), enabling you to access your gun firmly and quickly. HIGH QUALITY MATERIAL - Mainly constructed by neoprene and elastic material. Unlike ordinary elastic materials, the material we use feels more comfortable and supple, and is also more durable. 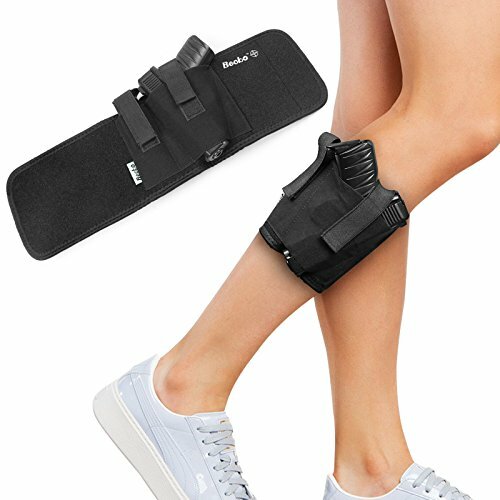 DESIGNED WITH PRACTICAL USE-Concealed ankle holster: Besides the main pocket for holding your gun, there is a magazine holder for spare bullets. 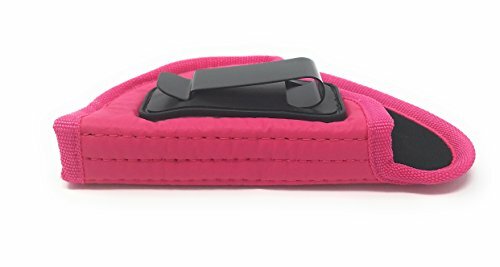 The Concealed Carry Women’s Universal Handbag Insert Purse Holster will fit into any handbag with a base length of 10-16 inches. The holster sits horizontally in the bag, and the barrel of the gun faces downward. It takes minimal space, leaving a lot of space for packing of other items into the bag. 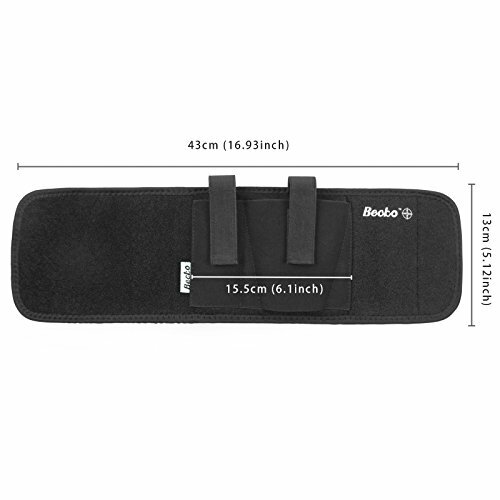 The holster has an elastic belt that can be fitted through the straps of an existing holster. It has adjusting knobs that extends up to 18 inches in length, meaning it can hold a wide range of firearms. The holster completely covers the trigger casing, reducing the risk of accidental firing. 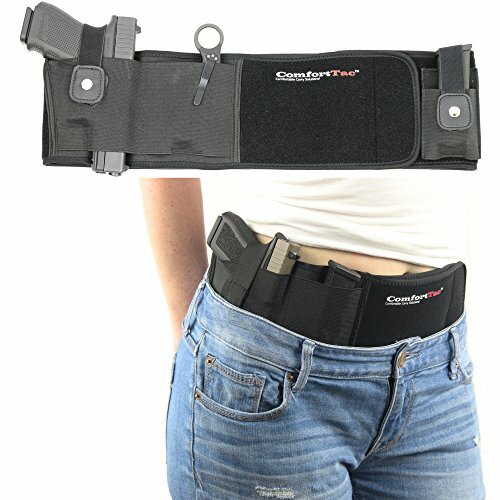 The holster can be placed in a bag in either arm for easier withdrawal. The holster can be fitted through the straps of an existing holster, and this provides comfort and familiarity when using a gun. It can be placed either on the right side of the body or on the left, making ambidextrous withdrawal possible. The holster completely covers the trigger casing, and thus reduces the risk of accidental firing. The gun is placed facing downwards, and thus in case of accidental firing, there is reduced risk of injury. The look may be too ‘manly’ for some women. 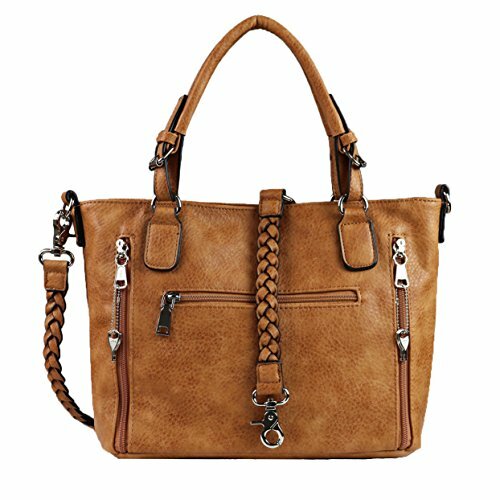 ✔ USE YOUR DESIGNER PURSE - Convert any existing purse into a CCW concealed carry handbag for 1/3 of the price! 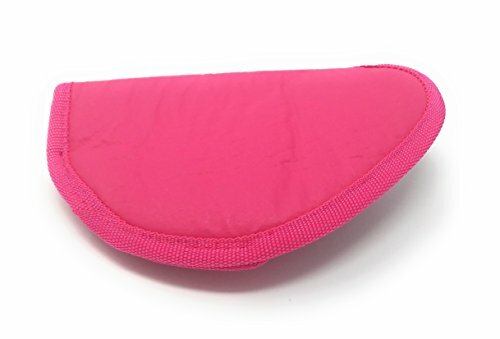 ✔ FITS MOST SIZE HANDBAGS - Fits any size handbag small or large from 10 to 16 inches in length. 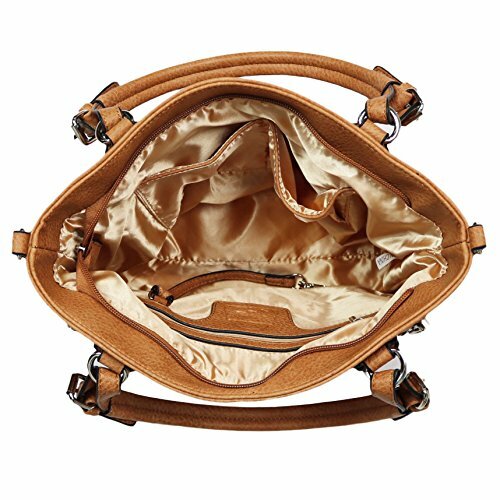 IMPORTANT: Please measure interior of your purse at the bottom (lengthwise) BEFORE purchasing to ensure it will work with your handbag. Patented length adjustment. ⭐️ COMBAT VETERAN OWNED BUSINESS - We are a team of U.S. military veterans using our combat experience with firearms to provide you with the most effective IWB concealed carry holster on the market. We also provide outstanding customer service! Our 100% SATISFACTION GUARANTEE and LIFETIME WARRANTY ensures you'll be making a risk free purchase with us. ✔ ACCOMMODATES ALL FIREARMS - Fits any size firearm, gun, pistol, and any caliber (subcompact, compact, or revolver). PLUS - Attach your existing holster to this platform through the belt loops through our patented design. 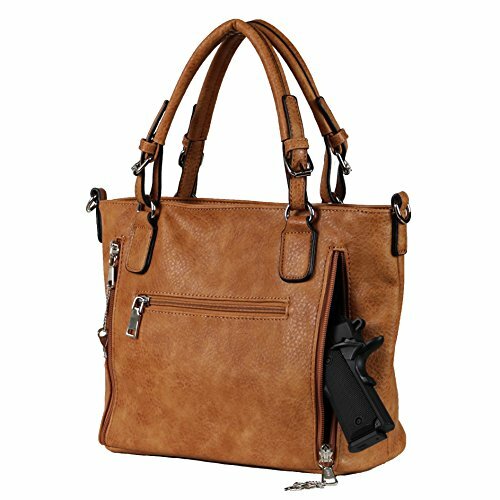 ✔ MINIMAL SPACE TAKEN - Great for women's concealed carry. Flat and sleek design takes up minimal room in your purse. 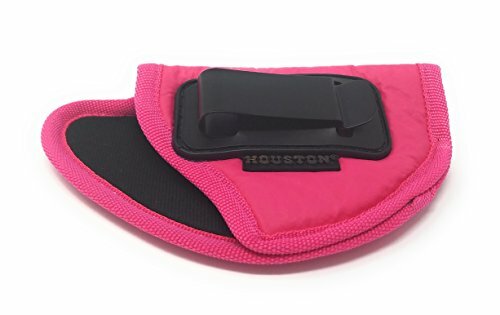 The IWB Woman Pink Gun Holster by Houston Gun Holsters comes in a bold pink color that is attractive to many ladies. Its interior is made of a smooth suede material for protection of the gun. The exterior is made of treated eco-leather that is both attractive and durable. It is water and sweat proof, small and compact, fitting a variety of guns like the Glock 42. It also has a metal clip that fits securely inside the waistband, ensuring total concealment. Made of a durable material that is waterproof and sweatproof, making it effective for high energy activities like jogging. The eco-leather can mold to the user’s body shape. The vivid pink color may be a turn off to some. This is for all of you handbag lovers. 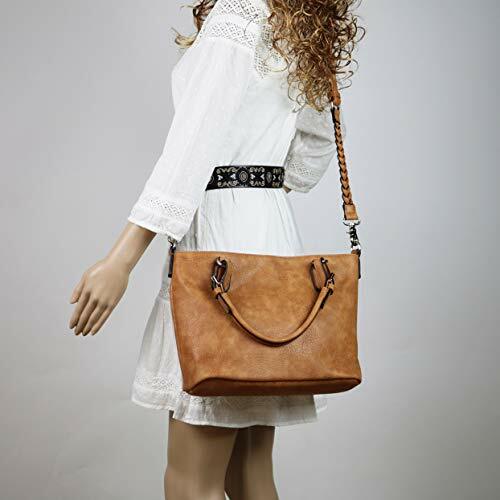 This attractive bag is made of cowhide leather and has multiple compartments to suit all your packaging needs. The gun compartment is on the side, and it is protected behind two YKK, 7.5-inch lockable zippers, with 4 keys included. 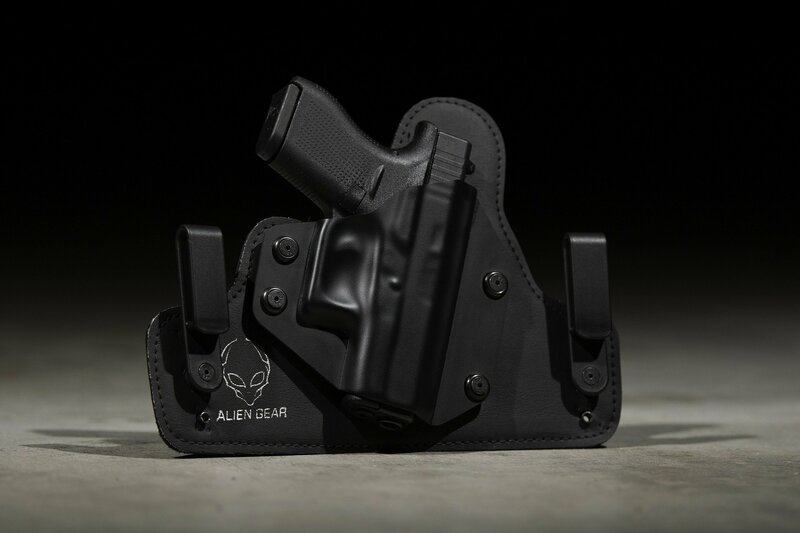 The holster is Velcro-lined for secure and precise gun storage. It is made of cowhide leather, which makes it long-lasting through adverse weather elements. The Leather Locking Concealment Purse can be worn on either hand, making it suitable for ambidextrous withdrawal. The bag comes in a range of colors to fit everyone’s taste. 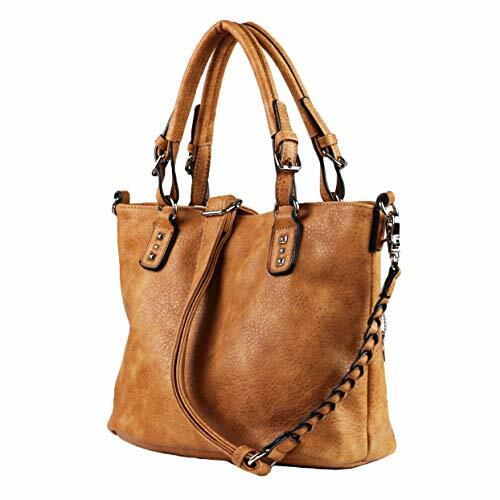 The bag is very modern and stylish. The size of the bag may discourage some users. 100% SATISFACTION GUARANTEED - If for ANY reason you are completely satisfied, we will refund 100% within 30 days. No questions asked.